John Henry is an American hero. Legend has it that he raced a steam-powered drill tunneling through a mountain to carve out a path for train tracks. Legend has it that he beat the drill and then he laid down and died. Research tells us that John Henry was a real person. But who was he? Where did he come from? How did he come to work laying down railroad track? Did he really beat a steam-powered drill? And did he really die right after? Scott Reynolds Nelson didn't initially set out to find the answers to these questions. He was first interested in the African American men who laid railroad track in the South. Some 40,000 men whose names were lost though their contribution to the railroad system was great. And Nelson's story isn't just a historical report about Reconstruction South and the building of the railroad. His story is a scavenger hunt, a detective story about how he tracked down the real John Henry. This book is chock full of photos, maps, and paintings depicting the railroad workers and John Henry. That was one of the first things I found really appealing. This book is a visual treat. I found the subject matter pretty appealing. The true story of an American legend. I didn't know anything about John Henry and I had no idea that he was a real person. 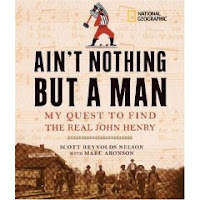 But even more than the facts about John Henry, I enjoyed reading about Nelson's tricky path to research. He met dead ends more than once and it took some creative thinking to keep moving forward. Of course, the more you find out about history, the more questions come to mind. This is a must-read for young historians. I'd also recommend it to anyone interested in trains, American tall tales, or African-American history. Appendices give further information on John Henry's origins, tips for budding historians, suggestions for further research, and an author's note about his sources. Happy Nonfiction Monday! Be sure and check out the roundup over at Picture Book of the Day! Sounds like a good book--I'll look for it!